We left Roosevelt Lake headed north on Route 188 to Route 87 south. A nice trip through the mountains with some marked steep grades, but not too steep. 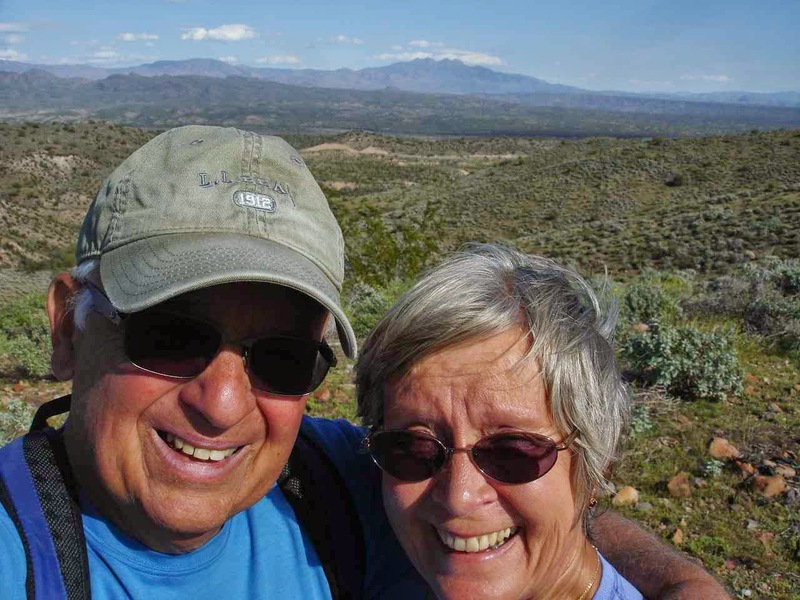 Lazy Daze friends Gayle and Jim of Life's Little Adventures had stayed at McDowell Mountain Regional Park in Fountain Hills, Arizona. They had some great pictures of their stay , so we thought we would at least take a look at the park . So, off we went with no idea of catching a site without a reservation. To our great surprise(January through March spaces are reserved up to 6 months ahead), there was an open space. Someone had just left early and we could have one night on Site 64. What a beautiful campground and park. 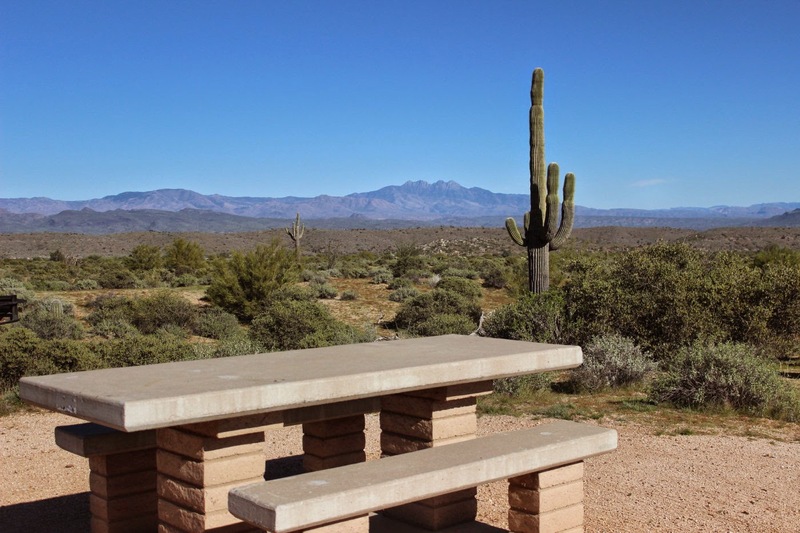 There are over 65 miles of multiuse trails in the park. That means hiking, biking, and horseback riding. This link will give you some idea of the activities in the park. McDowell Mt. Website. Look at all of the activities in that left column. Jan and I decided to hike rather than bike. We didn't know the trails and thought hiking was safer for us. It was so nice we did about 7 miles this day. The Granite Trail above was one of the trails we hiked. 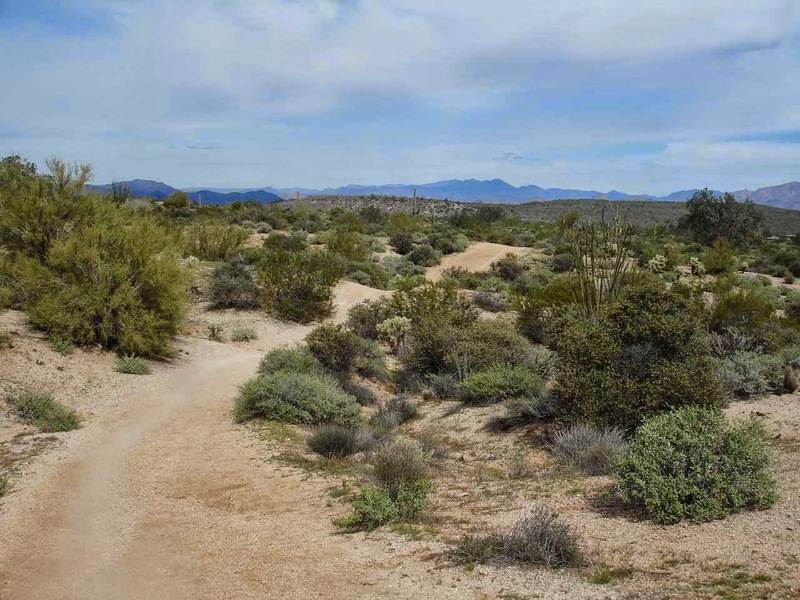 Beautiful views and lots of desert vegetation to view in 21,099 acres. 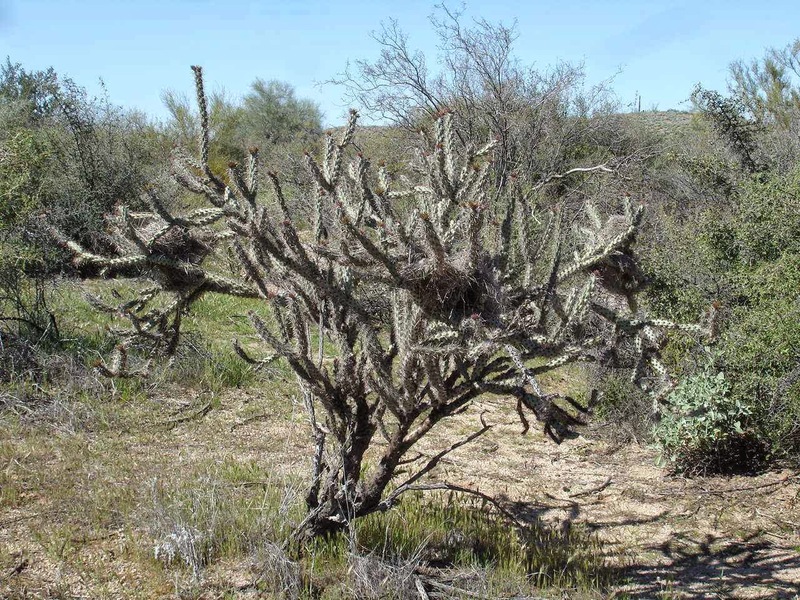 To the left was one of many cholla cactus. But this one had three nests! 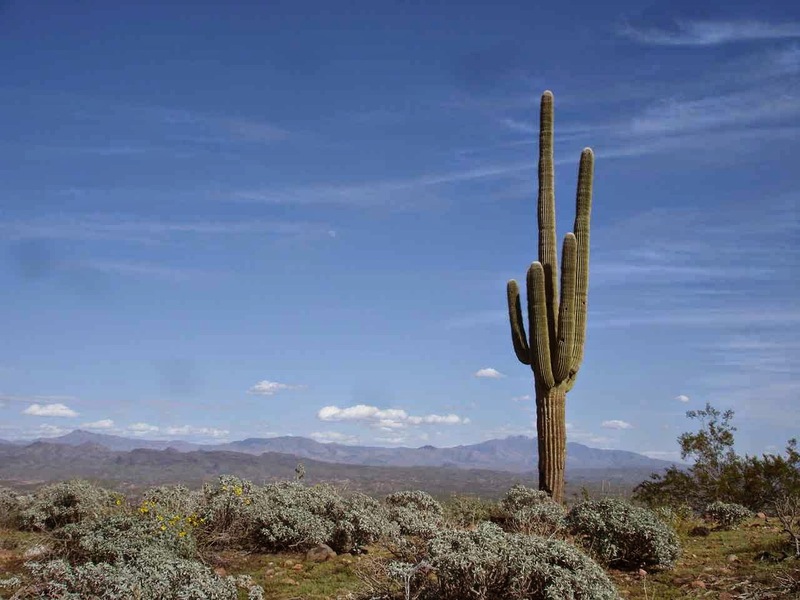 Jan and I try to imagine how the birds can fly into the cactus and not be bothered by the needles. Scattered along the trails were many sections of color as the desert begins to blossom. We believe these are a desert poppy. We are not overly confident of our plant names though. Personally, I'm good at saying "tree,bush,cactus, or weed"
For instance , this is a red flower on a medium sized bush. We tried to look up some of the flowers online, but there are a number that look alike. 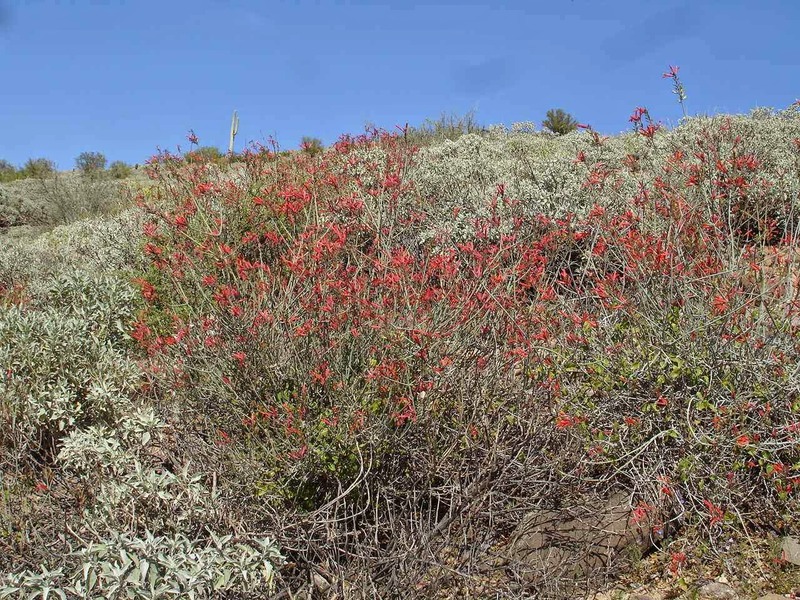 One red flower was called simply desert honeysuckle. And there a lot of small green bushes. 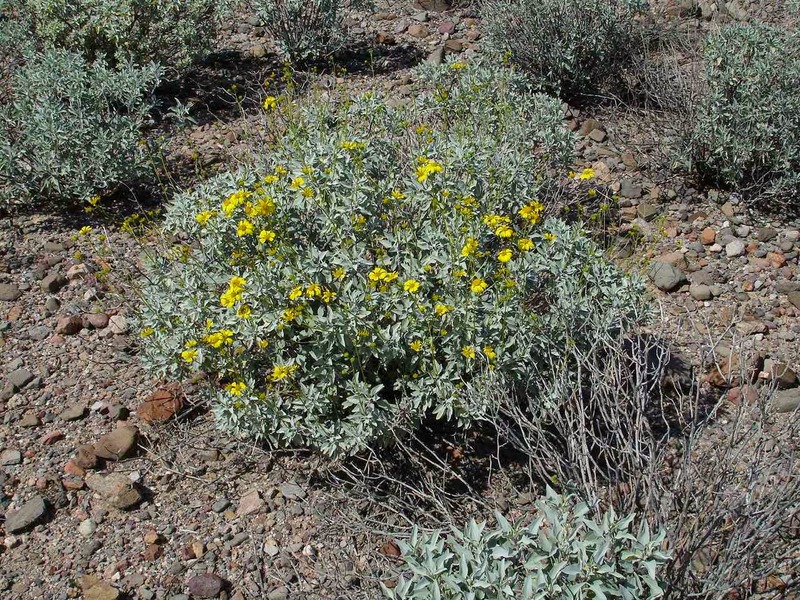 Some are a form of sage and others might be brittle bush--------------or , something else. 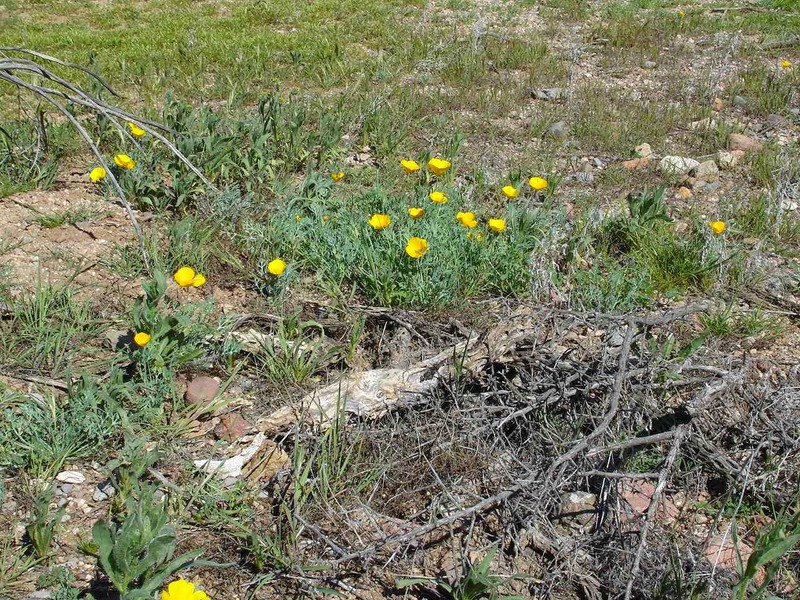 We thought this was brittle bush. No matter what the names of the plants, it is a beautiful park to hike or bike ride. We had signed up for two more nights in the RV overflow section---basically a parking lot sectioned off at one of the trailhead sites. This picture was from the top of the Scenic Trail. This was a moderate trail , narrow, steep in sections, and a bit rocky. Nonetheless we saw a few bike riders on the trail----just a few. This day we hiked about 6 miles and our muscles were well aware how far at the end of the day. Still not too confident of carrying the new camera for long hikes. But, we still tried a selfie at the top of the Scenic Trail with the older Sony. Nah-----they don't look too tired?? Besides being such a great place, we stayed to enjoy the good weather. The next few days were forecast (and turned out to be) rainy. The morning we left , our overflow and parking lot was filled with a few bike store trailers. They were offering free bike tryouts as well as tuneups. 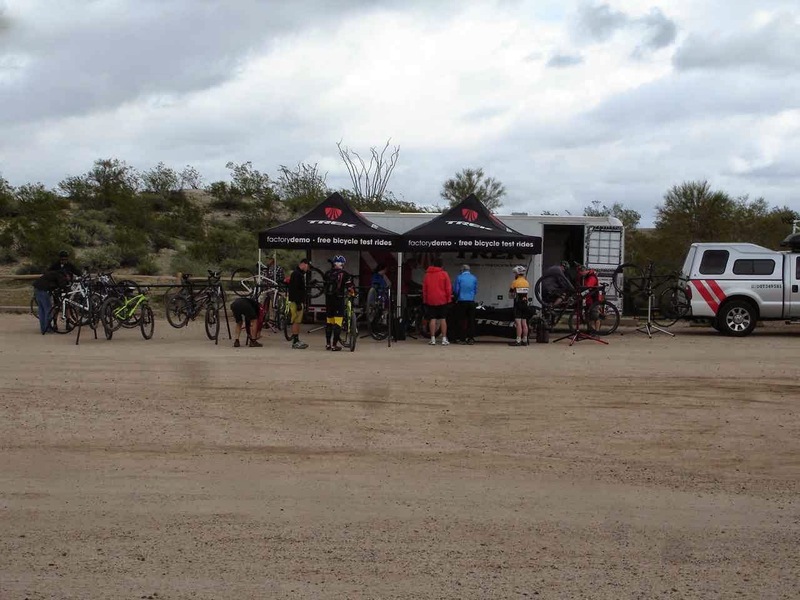 In spite of the weather, there were a number of interested bike riders. 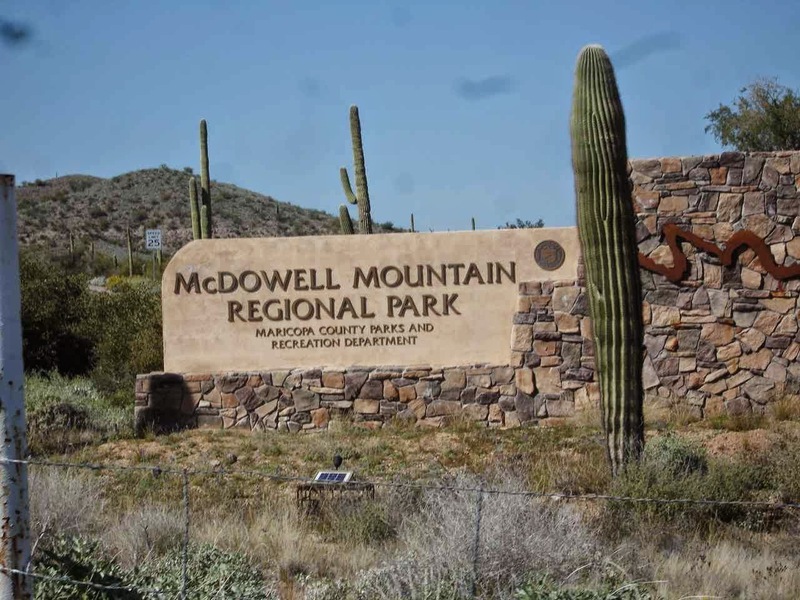 In fact, while we were there, the park was well used by local(Fountain Hill, Scottsdale, and Carefree, as well as other towns) bike riders and hikers. There was even a special off road bike competition course within the park. 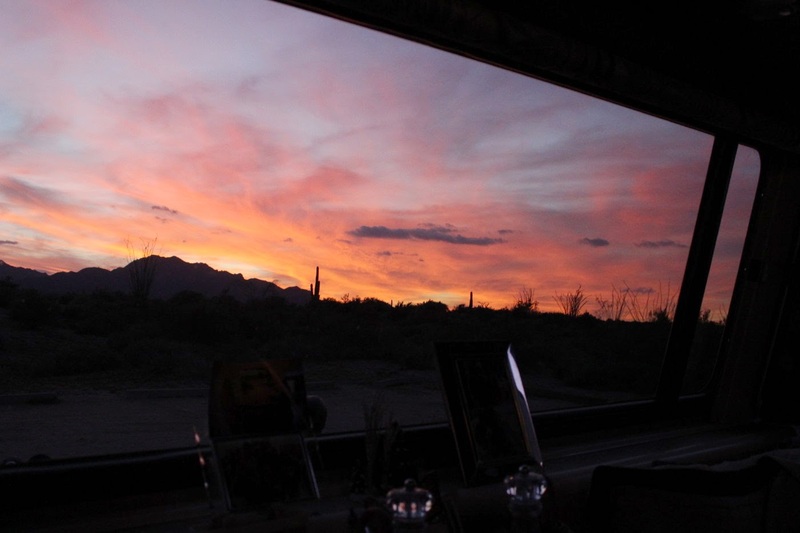 Even in the overflow area, we had a nice sunset as seen through Lady Blue's back window. 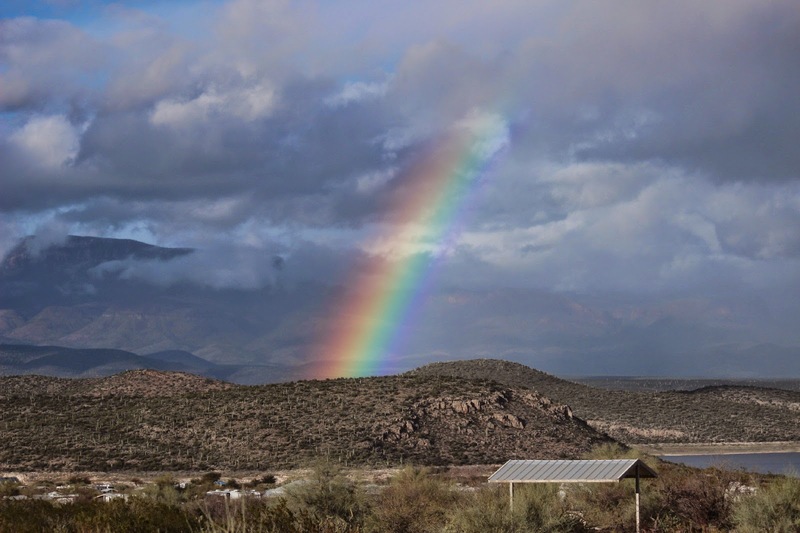 Before we sign off for this week, we thought we would add this picture from Roosevelt Lake. Jan and I could see the storm coming from miles away. Before we got heavy rain and some snowflakes, we could see the rain falling across the lake. The snow melted as it landed, just visible on the windows and in the air. And yes, a very nice rainbow sitting on top of the far hill. So glad you enjoyed McDowell!